Businesses, charities and other organisations that care for our woodlands and forests have today joined Environment Secretary Owen Paterson at a tree health summit to generate ideas on how to tackle pests and diseases attacking the country’s trees, including ash dieback. Around 100 people including scientists, campaigners and representatives from charitable groups and government agencies attended the summit where the findings of the mass survey of forests and woodlands were reported. A report on the very latest scientific information was also presented. • Focus action on newly planted trees - don’t cut down mature trees. A wide range of other ideas for action were identified, which will be examined in further detail. These and other ideas will now be considered for possible inclusion in a Chalara action plan to be published on Friday 9 November. “We called this summit to bring together the best ideas from experts and all who care for our forests so we can urgently prepare an action plan on how to tackle Chalara and better protect our trees for the future. 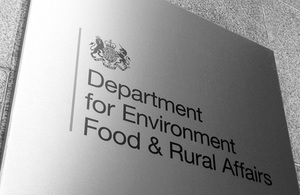 The tree health summit follows on from a number of actions the Government has taken to discover the extent of ash dieback and contain its spread. Over the last few days hundreds of people from government agencies and stakeholder groups have urgently surveyed over 2,500 thousand sections of land across the country; the largest operation of its kind ever undertaken. Owen Paterson also chaired a COBR meeting on Friday 2 November to coordinate cross-government action in tackling the disease.